Zin-mi, right, and her friend smile in Under The Sun. It’s a cute photo, but sadly, it’s one of the few times anyone looks happy in the film. Even here, the girls are probably just pretending. The subversive documentary film Under The Sun takes us to North Korea, where we observe 8-year-old Zin-mi as she eats with her parents in their apartment, attends school, joins the North Korean Children’s Union, and rehearses her part in a pageant that will celebrate “The Day of the Sun,” the birthday of Kim Il Sung, the grandfather of the current ruler, Kim Jong-un. 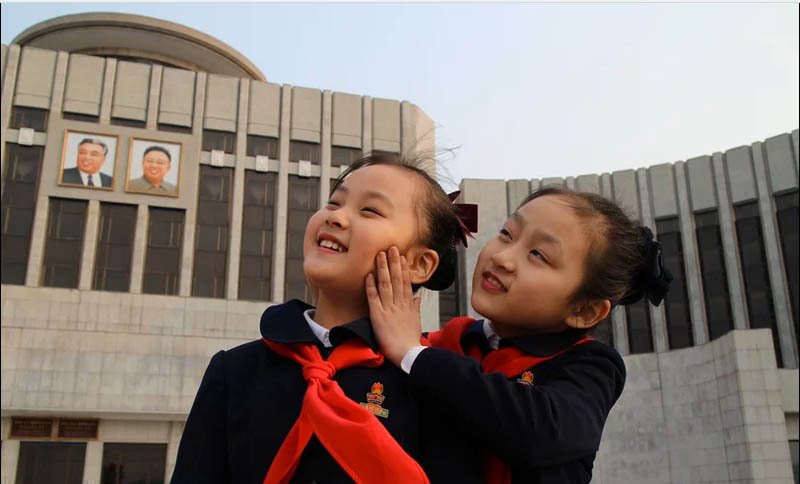 The Day of the Sun (April 15) is the most important holiday of the entire year in North Korea. Mansky wanted to make a film about day to day life North Korea, with co-operation from the government. He knew there would be restraints, but he got many more than he had expected. The script was written by the North Korean government. Government minders were always close by, telling people where to walk, what to say, to speak more loudly, to show more animation. “Look at her when she’s talking!” They would make people repeat dialogue over and over to achieve the appropriate level of breathless enthusiasm. Mansky had no freedom in choosing events or locations. He was not allowed to make small talk with any North Koreans in between shooting scenes. He had to show his footage to the government at the end of each day. You might expect the resulting film to be as exciting as the “Bulgarian tractor epics” of the past. The thing that makes Under The Sun different is that Mansky kept his cameras running all day. He did not wait for the government chaperones to yell “action,” and did not stop filming when they said “cut.” Despite all the supervision, he did not hand over ALL of his footage for scrutiny. I’ve read different explanations for exactly how that worked, but one way or the other, he had secret copies that the authorities probably did not know about until the documentary was released. On the other hand, he made filming two trips to North Korea in 2014, but never received his visa for a planned third trip. So maybe they did have an inkling, after all. Documentary filmmaker Vitaly Manksy in in Pyongyang, North Korea, in 2014. 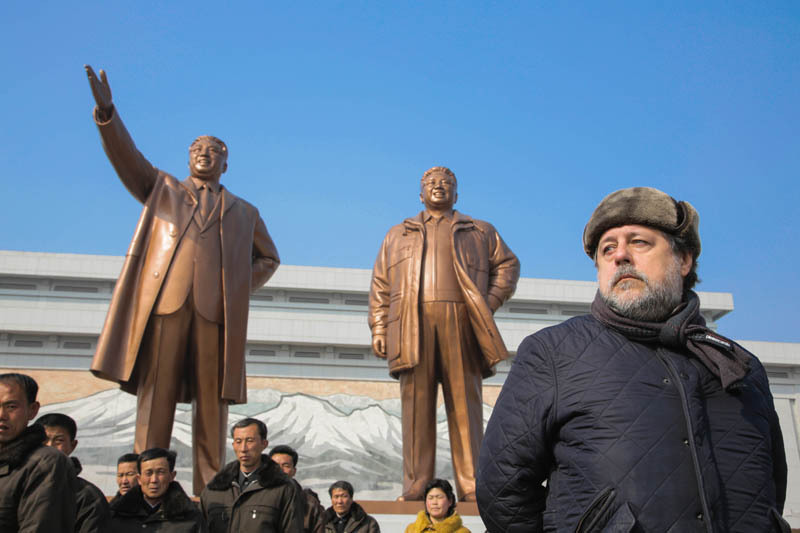 Mansky is standing in front of one of the many monuments to North Korea’s founder, Kim Il-Sung, and his son, Kim Jong-Il. A scene of garment workers celebrating their heroic production is exceedingly awkward and unnatural. In the first take, they have surpassed their government quota by 150 per cent. By the next take, the figure has grown to 200 per cent. Seriously, how dumb do they think we are? Even seemingly ordinary, boring scenes of people crossing a square or boarding a bus were scripted and directed. When films are sold on DVD they often include a behind-the-scenes “Making Of” documentary. Under the Sun has made those scenes an integral part of the film, instead of setting them apart. In their alleged apartment, Zin-mi and her parents sit in front of a table that’s crowded with luscious-looking food. Remember that North Korea is a country that has lost millions of citizens to famine. After Zin-mi and her father praise the health benefits of their national dish, kimchi, (several times) the table is carried out of the room, with most of the food untouched. What happened to it? Who ate it? Perhaps Zin-mi is perfectly healthy, but she is very slight and often looks tired. Too bad they didn’t let her eat some more. In one of the most heartbreaking scenes of the film, Zin-mi is asked how she sees her future. She has nothing to say, and starts to cry. Eight-year-old North Korean girl Zin-mi, the main character in Vitaly Mansky’s documentary Under The Sun, often looks tired and overwhelmed. Needless to say, Under the Sun has not been shown officially in North Korea, though someone recorded a screening somewhere, and showed it to North Korean authorities. Those authorities contacted the Russian government, which had provided some of the film’s funding, and asked that the film be destroyed and Mansky be punished. Mansky was criticized, but he was not punished; his film was not seized. In fact, it won the FIPRESCI Prize at the Message to Man International Film Festival in St. Petersburg, Russia. And while eight theatres in Moscow refused to show it, 20 others did. In 2016, New York’s Museum of Modern Art cancelled its screening of the film, though it apologized later. Vitaly Mansky was born in Ukraine, when it was part of the USSR. He spent most of his adult life in Russia, though he lives in Latvia now. Though the Sun of the title refers to Kim Il Sung (Il Sung means “to realize the sun”) we don’t see much sunshine in the film at all. Some wintry scenes look foggy, but is it really fog, or air pollution? Many scenes were shot in February. Mansky has said that it was very cold, even indoors. He lets us know by showing students warming their hands over a radiator in their classroom. Every room we see, whether public or private, has portraits of North Korea’s founder, Kim Il-Sung, and his son, Kim Jong-Il. There are many huge murals and monuments to them in Pyongyang. How much did those photos and monuments cost? How much food could have been bought with that money? In interviews, Mansky has speculated that many families do not live together. He thinks that many students live at their schools and he knows that many workers live at their factories. I’d like to know more about that. Even though North Korea is cut off from the rest of the world, clunky, ugly platform shoes managed to get in. North Korea is often demonized because it has nuclear weapons and an unpredictable leader. There has been some talk about bombing the place, “taking out Kim Jong-un,” etc. Films like Under The Sun add some nuance to the us-and-them narrative, and showing us the people who could be killed by those bombs. That name though….It’s a minor point, but the name Zin-mi was puzzling. In decades of watching Korean films I don’t remember anyone named Zin-mi. Articles about hangul, the Korean writing system, and hangul charts don’t show any symbols that correspond to “Z.” There are some online articles from South Korea that call her Jin-mi. Under The Sun was shown by RIDM+, January-to-May series of films presented by RIDM, the Montreal International Documentary Festival. RIDM will run from November 9 to 19, 2017.